Gastroesophageal reflux disease (GERD) is one of the most common causes of chronic cough in all age groups. When GERD is the cause of chronic cough, it has been prospectively shown that it can be “silent” from a GI standpoint up to 75% of the time, and there is a clinical profile that has predicted > 95% of the time when patients have silent GERD as the cause of their cough.Such patients have normal or near-normal chest radiographic findings; are not smoking or exposed to other environmental irritants; are not receiving an angiotensinconverting enzyme inhibitor; have either a negative methacholine inhalational challenge result or failure of their cough to improve with treatment for asthma; and have not had cough improve with appropriate specific treatment for postnasal drip syndrome. 1. 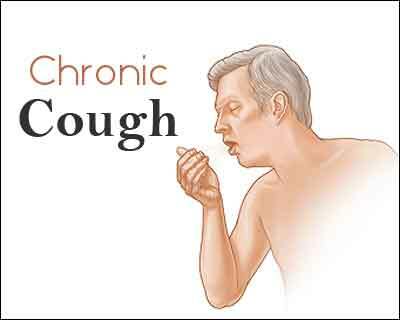 In adult patients with chronic cough, the Expert Panel suggests that the cough be managed according to a published management guideline that initially considers the most common potential etiologies as well as symptomatic gastroesophageal reﬂux (ungraded, consensus based). Remarks: Common potential etiologies include environmental or occupational irritants, primary or secondary smoking, use of angiotensin-converting-enzyme (ACE) inhibitors, abnormal chest radiographic ﬁndings, asthma, upper airway cough syndrome due to a variety of rhinosinus conditions, nonasthmatic eosinophilic bronchitis, and suppurative lung disease. Often, more than one etiology is a contributing factor. 2. In adult patients with chronic cough suspected to be due to reﬂux-cough syndrome, the Expert Panel recommends that treatment include (1) diet modiﬁcation to promote weight loss in overweight or obese patients; (2) head of bed elevation and avoiding meals within 3 hours of bedtime; and (3) in patients who report heartburn and regurgitation, proton pump inhibitors (PPIs), H2-receptor antagonists, alginate, or antacid therapy sufﬁcient to control these symptoms (Grade 1C). Remarks: (1) While it is expected that gastrointestinal (GI) symptoms will respond within 4-8 weeks, the literature suggests that improvement in cough may take up to 3 months. (2) Head of bed elevation is suggested based on its utility for improving GI gastroesophageal reflux disease (GERD) symptoms while acknowledging that it has not been demonstrated to be beneﬁcial for cough. 3. In adult patients with suspected chronic cough due to reﬂux-cough syndrome, but without heartburn or regurgitation, the Expert Panel recommends against using PPI therapy alone because it is unlikely to be effective in resolving the cough (Grade 1C). 4. In adult patients with chronic cough potentially due to reﬂux-cough syndrome who are refractory to a 3-month trial of medical antireﬂux therapy and are being evaluated for surgical management (antireﬂux or bariatric), or in whom there is strong clinical suspicion warranting diagnostic testing for gastroesophageal reﬂux, the Expert Panel suggests that they undergo esophageal manometry and pH-metry with conventional methodology (Grade 2C). Remarks: Esophageal manometry is done both to evaluate for a major motility disorder and to accurately position the pH electrode for the pH monitoring study. With conventional methodology, the pH electrode is placed 5 cm proximal to the lower esophageal sphincter, and the study is done off antisecretory medications after withholding PPI therapy for 7 days and H2 receptor antagonists for 3 days prior to the study. It was agreed by consensus of the Esophageal Diagnostic Advisory Panel composed of both gastroenterologists and surgeons that this is the only methodology with proven validity with respect to surgical outcomes. 5. In adult patients with chronic cough and a major motility disorder (e.g., absent peristalsis, achalasia, distal esophageal spasm, hypercontractility) and/or normal acid exposure time in the distal esophagus, the Expert Panel suggests not advising antireﬂux surgery (Grade 2C). Remarks: Under the circumstances of a major motility disorder or normal esophageal acid exposure on esophageal pH-metry, there is no supportive controlled data for antireﬂux surgery and there is quantiﬁable risk to the procedure making for an unacceptable risk-beneﬁt ratio. 6. In adult patients with chronic cough, adequate peristalsis, and abnormal esophageal acid exposure determined by pH-metry in whom medical therapy has failed the Expert Panel suggests antireﬂux (or bariatric when appropriate) surgery for presumed reﬂux-cough syndrome (Grade 2C). Remarks: With respect to deﬁning adequate peristalsis, there is no consensus. Some consider any preserved peristalsis to be adequate while others stipulate that it must be at least 30% and others at least 50% of normal.